All your medication data is linked and safely kept on cloud server to access with your personal account by Mobile and Web Application. You can share medication info amount your family. In case of emergency, this information could save your love ones. We provide connected medication care from your care providers to your home. Your Home medication care never been easier automated medication reminder with drug photo, dosage, full instruction and keep track of your medication usage to guarantee safety and effectiveness. Our medication risk warning system in PharmaSafe App can protect you from harmful medication errors such as drug allergy, drug interactions, drug duplications or adverse drug reactions, especially when you are under care of multi hospitals. When instigate with your hospital appointment system, PharmaSafe App will remind you doctor appointments with instruction before visit. Medication record in the app will provide your physicians important information they need to give you a better care. PharmaSafe is a digital platform that connects prescriptions from hospitals and pharmacies with patients at home. 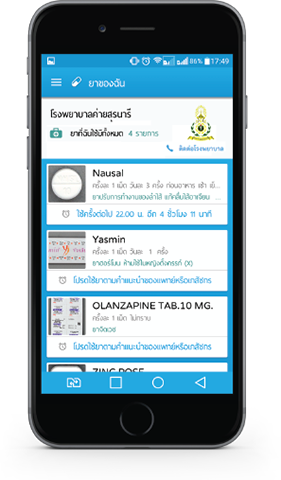 Once medicines are dispensed, the system automatically send drug information and direction to patient via a mobile application. Without any manual inputs, the application will automatically remind patients of dosage and time to take their medicine as doctors directed to increase medication adherence at home. It also detects drug usage risks or drug interactions from different sources of prescriptions and alert patients to increase home medication safety. It also reminds patient doctor appointment to ensure continuity of care. For healthcare providers, PharmaSafe connects patients home medication behavior data with prescription data from all sources to provide the most complete medication report the industry ever seen. For pharmaceutical industry, PharmaSafe is a complete source of market insights and market intelligence from real-time data of both prescriber and patient side. Lack of enough connected information and instruction in medication at home is causing many big problems in healthcare such as poor treatment outcomes or failure, adverse drug reaction/ interaction, antibiotic resistance, medication abusing(non rational drug usage) and other medication errors. These problems increase nations health spending and lower health quality of people. 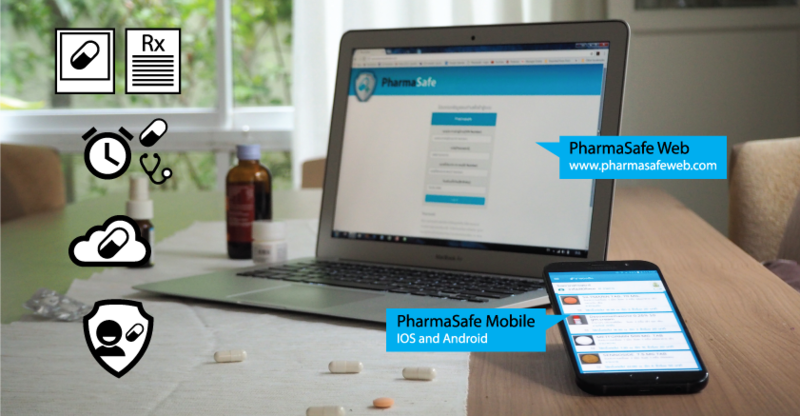 PharmaSafe is a personal medication care Mobile/Web application with database management platform that connects with HIS to automatically provide patients personal medication info and care. My father almost died 2 years ago in Bangkok. I got a phone call saying to rush to the hospital’s Emergency room as my dad suffered a severe stroke. The doctor asked me what medication he was on, the names of the specific drugs and what were the dosages. I said I don’t know so I called my brother to go home and to bring all of dad’s medicine to the emergency room. This took a few hours and sadly is quite common. Luckily dad survived. It then angered me that the doctors did not have access to a persons medication record. I talked to my girlfriend, who is now my fiancé. She is a Lieutenant Colonel and licensed pharmacist in the Thai Army hospitals. She said that such a patient system does not exist but that a system focused on drug medication, reminders and with proper, accurate, drug information would be extremely useful to pharmacists. But, in Thailand Big Pharma and Generic drug companies do not have to provide their drug information on ingredients, interactions, allergies, warnings etc to the patients. This was quite surprising to me, but what surprised me even more was that the Thai Ministry of Health did not have a comprehensive database of all the drugs being sold into Thailand. The idea of a trusted companion to Pharmacists was born…..what if hospital pharmacists could give this type of system out to their patients. This was the beginning of Pharmasafe. We now have the largest proprietary database of over 20,000 ++ photographed cataloged drug information directly from Big Pharma and pharmacists in Hospitals---even bigger than the Thai Ministry of Health’s database. Personal medication record with you everywhere on mobile and web application. Drug Identify is easy with photos and leaflet. Auto or manual medication remider. Auto adverse drug reaction warning system. Auto doctor appointment alarm with instruction. Drug allergy and medication record linked with multi hospitals providing you care. 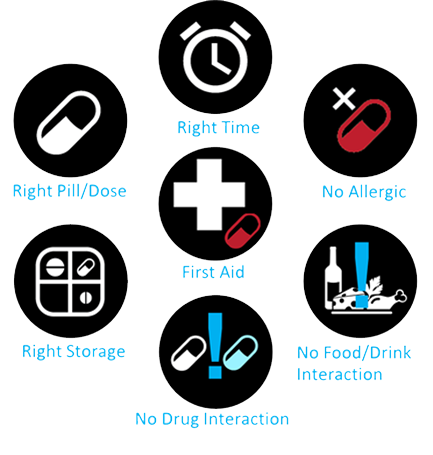 How PharmaSafe helps user increase personal medication safety? Insufficient drug information could be very harmful. Information such as dosages in different conditions or patients, warnings, dose drug-drug or food-drug interactions, adverse reactions, overdosage, storage suggestion, first aid in case of drug reactions and more. Even though doctors could given detailed instruction, many times, patients could forget and practice medication incorrectly at home. By providing linked information from any of your medication sources and automate assistant/risk protection system via mobile application, PharmaSafe help you reduce all the factors causing drug misuse and increase effectiveness.